The fractional glass windscreen underlines the sturdy construction but yet, its round shape gives additional elegance to the vessel. At the stern, the saloon welcomes guests through a three piece foldaway door. The living area is composed of a fully fitted galley and a vast dining/lounge which is literally bathed in sunlight, thanks to the size of the surrounding windows. This is the motto of the Sundeck 580 as well as all of the Sundeck Yachts – use the vessel as your fantastic villa on the sea. in the interior, the teak floor brings fresh elegance and comfort. The saloon sofa and seats are upholstered in leather or fabric as requested. A side door, from the helm station gives quick access to the companionway, making singlehanded docking operations easier. The rear bathing platform is offered in fixed form or with hydraulic lift to facilitate easy tender launching. In order to increase fuel efficiency, next generation, common rail injection, diesel engines, are offered in several power and brand configurations. Ranging from 450, 500 and 570 hp engines which are coupled to traditional direct shaft drives for the best reliability. An option is the yacht controller system which works on the engines, thrusters, and windlass, allowing easy single handed operation. When cruising at displacement speed, the Sundeck 580 burns an incredible small quantity of fuel, while at top speed, the yacht reaches and can exceed 25 knots, whilst still keeping economical consumption rates. Tropical chilled water, air conditioning system, powerful diesel 220V generator and an ice maker. The zero speed gyro stabilizers gives added comfort aboard, adding unbelievable stability to the vessel whether at anchor or at displacement cruise speed. For the accommodation below decks, several layouts are available, from two to four staterooms, with two or three bathrooms en suite. These layouts will suit all types of owner’s requirements as well as charter companies, and as we offer custom built Yachts it is even possible to have an office or a private meeting area incorporated. At the stern, accessed from the transom, is the self-contained crew quarters, featuring two bunks and one crew head, it is also the perfect location for the washing machine. Quality wood work manufactured by our skilled artisans in the construction of the yacht allows us to attain a state of the art finish. Our methods, processes, and the quality of materials used at Sundeck Yachts, delivers a yacht which will ride the seas for decades, with timeless beauty. The Sundeck 580 is without question the perfect yacht to discover how pleasant life on board can be! The Sundeck 580 offers great live aboard space with plenty of space on deck. The seating and sun pad areas are upholstered with quality materials by craftsmen and truly distinguishes your new residence at sea. The fly bridge is designed for you to enjoy life “en plein air” and sunbathing, every moment of the day. The dining area seats eight-ten people and converts, if needed, to additional sun beds, thanks to the adjustable stainless steel table pedestal. An easy installation canvas bimini is also available. To complete your fly bridge living area a summer galley with fridge, grill, sink, is available and includes a convenient deck fresh water washing station. 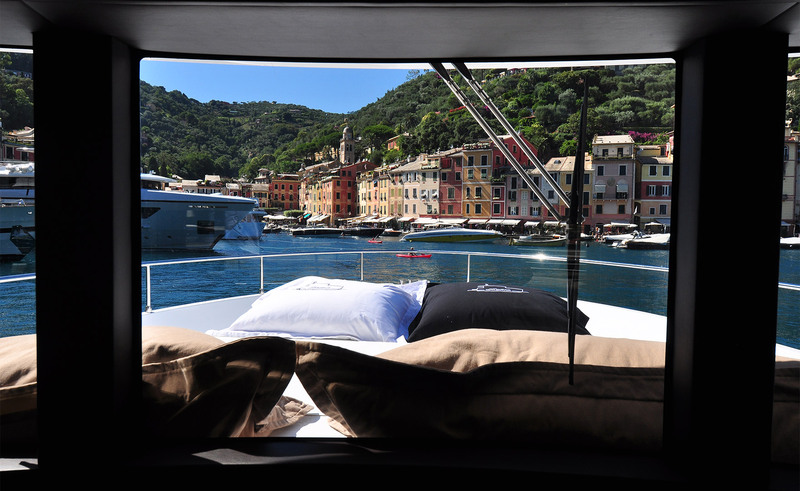 Every Sundeck features sun beds capable to allow all guests aboard to enjoy sunbathing. One of the main characteristics of Sundeck Yachts is the amount of space available everywhere: whether it be the interior or outside space, they all take advantage of the oversized beam from the bow to the stern, so that comfort and life style are enhanced to the maximum.